The Fairbank Arizona Ghost town, where Jeff Milton traded shots with the Alvord Stiles before being seriously wounded. This occurred as the the gang attempted to rob the N.M. & A. (New Mexico and Arizona RR. Burt Alvord, a part-time lawman, part-time Train Robber, and full-time problem. It was his gang who had the misfortune to find that Jeff Milton was guarding the very funds that they were hoping to rob. A request to Cochise County officials to make Jim Burnett Justice of the Peace at Fairbank. Years before Burnett had presided over a court during part of Charleston's boom days, making himself notorious in the mind of many, and getting away with many questionable activities that should have landed him in jail. A close in view of the N.M. & A. depots southern facing wall at Fairbank. Note that even in the historic period, both spellings of Fairbank, with and without the s were used. Telegraph insulators as well as the sign for the Western Union telegraph office are visible at the left side of the image, as is the Well Fargo Express sign just above it. An historic photo of the Fairbank School House, today a beautifully restored museum by the BLM. Advertisement for the "4-Paws Monster United Railroad Circus" which played at Fairbank due to its railroad access. Patrons from Tombstone would take the wagon ride to Fairbank to see such shows. Taken at the N.M. & A. railroad depot at Fairbank, this close up shows a dog who may be earning his keep by sitting up on his hind quarters for the travelling public. As is often the case with newspaper articles, they contain a mixture of fact and fiction. This article does illustrate that long after its neighbors near the San Pedro River had gone to ruins, such as Drew's Station, Contention City and Charleston, Fairbank would endure well into the 20th Century, and today is the last of the river towns with any substantial buildings still intact, but still a mere shadow of its former self. The top photo shows a latter train depot that was constructed further south from the first Fairbank depot, constructed by the N.M. & A, pictured at the bottom. Neither building exists at the Fairbank site today. A Western Union Telegram with a dateline at Fairbank sent to Albert Springer at the Tombstone bank, from Tombstone Mining success story E.B. Gage. Prior to becoming clerk at this bank, Albert Springer had tried his hand at being a merchant in Charleston, first in the partnership of Springer and Detoy, and later as one half of Springer and Hackes. Following a robbery and a substantial bankruptcy, Springer moved to Tombstone and more steady employment. E.B. Gage is remembered in the Earp story for his financial support of Wyatt Earp when in need of bail money, as well as during his vendetta. The above two maps of Fairbank are courtesy of Cochise County Recorder Christine Rhodes. 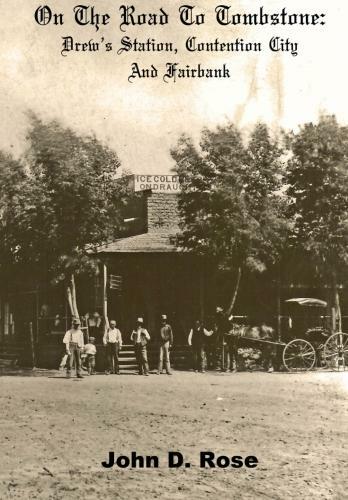 The cover of my second book, "On the Road To Tombstone: Drew's Station, Contention City and Fairbank," showing one of my favorite photos of Fairbank on the cover. Copyright John D. Rose. 2012-2018.